We want to thank everyone who participated in our #ShareYourStripesAL Challenge! 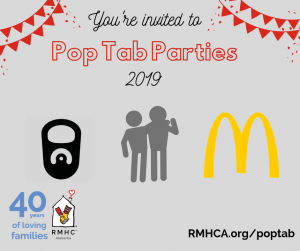 All of the images were so creative and fun and we love seeing you in your red and white stripes supporting RMHCA. We said we were going to pick the most creative entry and we have to say The Red Barn blew us away with their creativity!! I mean, red and white stripes ON a horse + socks ON a horse — can it get more creative than that?? We also love that The Red Barn won because we are happy to announce we will be partnering with them for some family programs very soon! We hope everyone had fun taking and seeing the images around social media. Now be on the lookout for Willow who will be featured on digital billboards all around town!! Don’t forget to wear your red and white stripes all week long in honor of #DayOfChange (which is Thursday 10/15)! 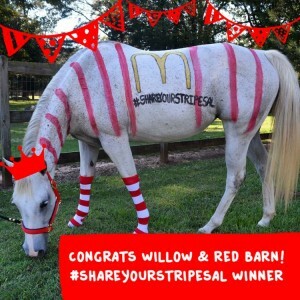 If you are interested in getting some of our awesome red & white stripe socks (just like Willow) come by the House any weekday between 8-5 or at one of the participating McDonald’s locations on a Day of Change. These socks can be yours with a $10 donation while supplies last. To learn more about Day of Change and how you can get involved, visit our Day of Change page or join our Facebook event!